VERSATILE, STYLISH AND UNIQUE: Let’s take a closer look at what makes the new 2019 Street Scrambler brilliant fun to ride. ENGINEERING EXCELLENCE: Triumph Motorcycles are committed to developing motorbikes that deliver the perfect riding experience through a fusion of precise confidence-inspiring easy-handling, thrilling torque-rich engines and distinctive original design. Through constant evolution our aim is to always provide our riders with the best possible riding experience and to offer the most inspiring and exciting range of motorcycles. Now with the new 2019 Street Scrambler there is even more class-leading capability to choose from in our iconic modern classic line-up. EXHAUST SYSTEM: The Street Scrambler’s distinctive style and poise come courtesy of a host of engineering innovations, the most intricate of which being its signature high pipes which invisibly incorporate a full catalyst system. Delivering the Street Scrambler’s uninterrupted lines the header pipes have been crafted using dual inner and outer skins, laser cut to manage the exhaust gasses without interrupting the clean and elegant lines of the system. HANDLING & CAPABILITY: Whether you’re cruising the streets or riding the dirt tracks and green lanes, the Street Scrambler is designed to deliver easy precise handling and a balanced agile feel, with a level of custom style and rugged attitude that is instantly recognisable and stands out from the crowd. Intuitive, confidence-inspiring and (more than anything else) fun to ride, this beautiful motorbike provides a wonderfully accessible option for riders looking for a distinctive motorcycling experience. DESIGN ORIGINALITY: Unique iconic clean lines, minimal bodywork, and premium modern finishes; the Street Scrambler is one of the most beautiful eye-catching motorcycles you’ll find. The authentic scrambler styling and enhanced ergonomics give a commanding riding position and incredible all-round performance and riding feel. 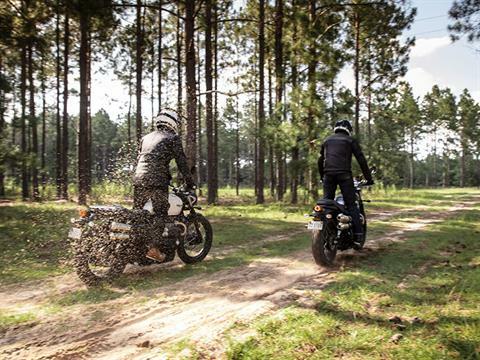 TECHNOLOGY & CAPABILITY: The instantly recognisable Scrambler style is complemented perfectly by advanced riding technology that’s hidden for minimal visual impact, including a ride-by-wire system with two class-leading riding modes (Road and Rain) for enhanced control, liquid cooling system for fuel efficiency, and its signature clean line hidden cat box exhaust pipe run. UPDATED TWIN ENGINE: A high performance high torque 900cc twin Bonneville is the impressive engine that powers the Street Scrambler. With 10PS more power for 2019, it has been designed and tuned for low-down torque and instant response right through the rev range, delivering a unique character to this versatile motorcycle, which is of course is all part of its character and charm. LIQUID COOLED EFFICIENCY: To meet Euro 4 emissions expectations, the new 2019 Street Scrambler’s 900cc Bonneville engine’s liquid cooling delivers efficiency improvements and enables rapid engine warmup to minimise cold start emissions. The iconic cylinder head fins still deliver an amount of air cooling that contributes to the Street Scrambler’s minimal radiator profile and size. DISTINCTIVELY BRITISH: Achieving high levels of modern engineering excellence together with beautiful lines and creative flair, there is a uniquely Britishness style to the Street Scrambler. And this distinctive Triumph twin, with its unique compact high level exhaust system, generates an unmistakable scrambler soundtrack – one of the great British motorcycle sounds – to match this bike’s rugged character. QUALITY OF FINISH: The Street Scrambler’s stripped-back custom design reflects the signature hallmarks of original scrambling style, and for this new 2019 generation there’s an even higher level of premium contemporary branding including a new Street Scrambler logo, new instrument styling, and a new adventure-oriented seat finish. This comes in addition to a host of high value modern finishes including an elegant fuel tank and single throttle body with aluminium finisher, black sculpted engine covers and subtle minimal side panels & mudguards. BONNEVILLE 900CC TWIN ENGINE UPDATED FOR HIGHER PERFORMANCE: There’s more power and performance from a new generation Bonneville 900cc engine that has been updated with a new magnesium cam cover, new lightweight crankshaft, a mass optimised clutch cover, and a lighter clutch. This significant engine upgrade brings 10PS more peak power, an increase of 18% on the previous generation Street Scrambler, and a new higher 7500rpm rev limit – all designed and tuned to deliver even more low-down and across the entire rev range. HIGHER SPECIFICATION FOR AN EVEN MORE IMPROVED RIDE: This new generation of motorcycle brings with it a significantly improved specification. As well as the updated Bonneville twin powerplant with 18% more peak power, the 2019 Street Scrambler’s new Brembo front brakes give the rider excellent stopping power, greater control and even more feel, whilst new cartridge forks (with scrambler-style rubber gaiters) offer a full 120mm travel suited to every type of road. Contributing to the Street Scrambler’s commanding riding position and signature silhouette are classic large-sized spoked wheels and dual-purpose Metzeler Tourance tyres fitted as standard. FIRST-IN-CLASS TECHNOLOGY NOW WITH TWO RIDING MODES: Two riding modes – Road and Rain – are first-in-class technology additions that manage the throttle map and traction control settings to improve your control and enhance your ride whatever the riding conditions. A range of additional high quality riding technology is also cleverly incorporated, with minimal visibility to maintain the motorcycle’s clean lines and stunning silhouette. Switchable ABS together with switchable traction control manages the Street Scrambler’s torque to improve ride quality, while the torque-assist clutch makes it easier to ride for longer journeys. 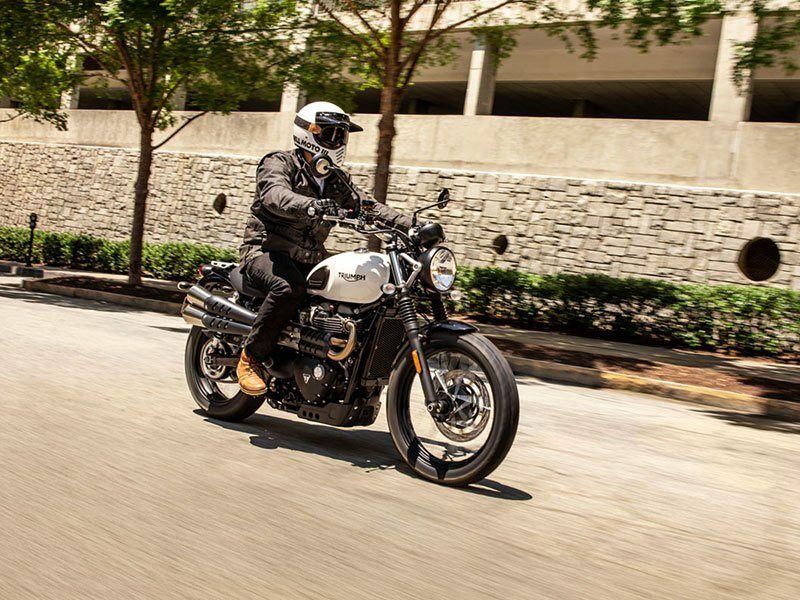 BEAUTIFUL SCRAMBLER STYLING SUPERB STYLE AND POISE: It’s beautiful and it's eye-catching; the new 2019 Street Scrambler is instantly recognisable with exciting premium design updates that deliver even more style and distinctive character. Its iconic Triumph scrambler silhouette, clean lines, minimal bodywork and high quality modern finishes reflect the very best of today’s modern custom style. Loaded with significant technology, features and details the Street Scrambler has real substance to go with its stunning good looks. THRILLING SCRAMBLER SOUNDTRACK: THAT UNMISTAKABLE HIGH LEVEL TWIN EXHAUST. 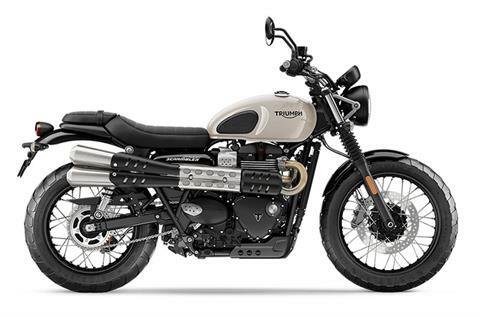 Delivering the rich British twin scrambler soundtrack is the Street Scrambler’s elegant twin high level exhaust system. With brushed stainless steel headers, that follow a crafted tight-radius flowing line, this exquisitely engineered exhaust incorporates an intricate header run that hides the cat box out of sight between the heat shield and Triumph’s signature finned engine barrel. Finished off by brushed stainless steel silencers with cool contrasting black heat shields, this is one of the hallmarks of the original true scrambler style. IMPROVED DETAILING AND FINISHES: PACKED WITH STYLISH NEW ADDITIONS. A host of additions to the Street Scrambler’s world-renowned custom classic good looks bring an even greater level of premium finish. New contemporary touches include a new Street Scrambler logo on the side panel, new instrument styling and a new adventure-oriented seat finish. Stripped-back custom styling finishes include; elegant fuel tank with locking cap, black engine covers with Triumph maker’s mark, and single throttle body with aluminium finisher. 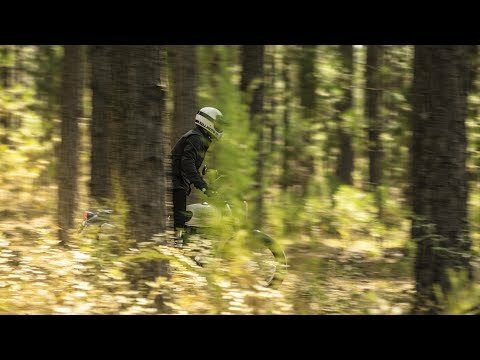 DYNAMIC SCRAMBLER ERGONOMICS & HANDLING DESIGNED FOR COMFORT & CONTROL: There’s a dedicated scrambler chassis that’s set up for sure handling, including; a unique frame, wide aluminium handlebars, forward set pegs, long front & rear suspension and a big 19-inch front wheel. The result is a commanding upright riding position for both urban and open road riding, plus a natural off-road riding position that encourages great capability on unsurfaced roads, even when standing. OVER 120 ACCESSORIES FOR YOUR OWN CUSTOM SCRAMBLER: The base for countless custom builds all over the world, the Street Scrambler has been designed to provide the perfect opportunity for every rider to personalise their bike much more easily than ever before. Now, with over 120 accessories, this Street Scrambler can be tailored to suit you and your style, bringing even more rugged off-road focus, more style, more everyday usability, and there are now even more stylish luggage options, too. A2 LICENCE KIT STREET SCRAMBLER ACCESSIBILITY: Making the Street Scrambler even more accessible is an A2 licence kit, which enables a unique APS twist grip and engine tune, making it even easier to own a genuine motorcycle icon. Fitted by a Triumph dealer, full power can just as easily be reinstated by having the kit removed once you have your full motorcycle licence. MORE SCRAMBLER STYLE: Already the very definition of original scrambler style for the modern custom era our extensive accessory range provides every rider with a host of additional options to add their own personal touch and further enhance that distinctive scrambler look. Slip on Vance & Hines single-exit silencers, Traditional scrambler twin bench seat, CNC-machined aluminium foot rests and gear peg with etched Triumph branding, Fender eliminator with minimalist number plate holder, Forged and machined aluminium handlebar clamp in black anodised finish with machined Triumph wordmark and exposed aluminium detailing. MORE RUGGED OFF-ROAD FOCUS: Reflecting Triumph’s unparalleled scrambling heritage, we have a host of accessories purpose made for the 2019 Street Scrambler that deliver even more off-road focus and rugged capability. Including: Adjustable rear piggyback FOX shocksHigh level front mudguard with shortened lower mudguard. Black glass-filled nylon headlight grille, with a pressed steel matt black finish bezel, Forged and machined aluminium handlebar brace in a black anodised finish, Pressed stainless steel sump guard. MORE ALL-ROUND CAPABILITY: MORE ALL-ROUND CAPABILITYThe new 2019 Street Scrambler has been designed for riders who want the best in terms of all-round performance and feel. When you’re on your bike every day you’ll want it to satisfy all your riding needs, which is why we offer a wide range of high specification accessories that deliver that extra touch of capability, including: Internally wired dual temperature heated grips, Steel fabricated centre stand kit (in black powder coat finish), Auxiliary power socket and cockpit mounting kit, Highly durable fabricated steel engine bars (in powder coated graphite grey or black), Pressed and fabricated steel chain guard (in black powder coated or chrome finish), Short or tall fly screens, Six-position adjustable levers with forged black arms and machined detail. NEW LUGGAGE FOR 2019: To give your new Street Scrambler even more capability on longer journeys, we’ve developed an exciting new range of luggage so you can ride even further. 12L Hyperlon and waxed cotton rugged tank bag, 20L rugged tail pack with black Hyperlon and waxed cotton construction , 25L rugged pannier with black Hyperlon and waxed cotton construction , Genuine leather and waxed cotton water-repellent 10L tank bag, 8.2L nylon tank bag with carry handle, Leather and wax cotton panniers with 13.8L capacity per bag, 30L quick-release lockable top box with integrated carry handle. NEW URBAN TRACKER INSPIRATION KIT: To show what you can do with our extensive accessory line-up we’ve also created a new exciting inspiration kit, the ‘Urban Tracker’, that brings even more cool scrambler style and touring capability - with luggage, number board kit and distinctive high front mudguard set-up. This can be used as the starting point for you to design your very own custom Street Scrambler using our easy online configurator, or to have fitted as a complete set by your Triumph dealer.25L rugged pannier & mounting kit, Slip-on Vance & Hines silencer, CNC-machined black oil filler cap, Black handlebar brace, Number board kit, Black ribbed bench seat, Black dresser bar kit, Headlight grille and bezel ,High level front mudguard, Sump guard kit.